Back in October, we found out that Starbucks would offer a brand new, holiday-themed, flat white latte at some point during the festive season. But we didn't know when, and we didn't know what it would taste like. Now, after some serious thumb-twiddling, it looks like we'll finally get to try the new beverage. Starbucks is giving us all a post-Turkey Day present, because the latest limited-edition latte is available at your local Sbux beginning today. 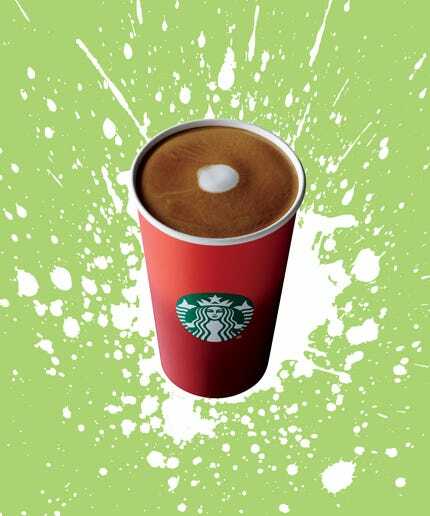 We already knew the latest drink would be called the Holiday Spice Flat White, but now we know what's in it. It starts with ristretto shots of espresso, followed by a spice mix of ground sugar, cinnamon, ginger, nutmeg, clove, and citrus-y tangerine sugar. The whole thing is finished off with steamed milk and that signature flat white latte-art dot on top. The new take on the flat white is a result of the beverage's popularity among Starbucks fans after it was first introduced earlier this year. Refinery29 got a chance to sample the new drink before it hit stores, and we think it will be great for latte lovers who don't want something super-sweet. You still get the subtle holiday-spice flavors, but this is not like a typical PSL or Gingerbread Latte. So, if you want a little seasonal cheer without too much extra sweetness, you've just found your new holiday favorite.